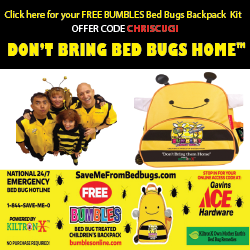 Some say bed bugs weren’t a problem 20 years ago, when the industry used heavy duty chemicals to kill them, but bug expert Brian Jervis with the OSU Extension says in the last five years the bugs have become a growing issue in Green Country. He says the issue will only get worse, because the level of insecticides currently used doesn’t thoroughly kill bedbugs like it used to. Jervis says they used to keep track of locations where bed bugs were found, but because they are now so frequently reported, they no longer track them, and the health department says for that same reason they no longer track them either. Jervis says current sprays are often not strong enough to kill the bugs in one visit, and the multiple exterminator visits that are usually required can get expensive for consumers. Bug experts says this problem is likely to get worse, because a lot of people are not educated on how bed bugs live and travel. See bed bug symptoms here.